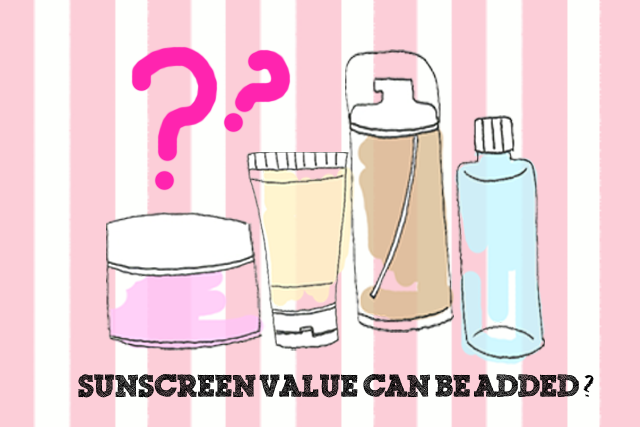 Does SPF Value can be added by more than one product? Assalamualaikum and hello everyone! Yes! I have been struggling to post a blog post because since the new year I have been struggling to my resolution. I want to work harder this year and achieve my goals! Insya Allah... So today I wanna share a tips for you guys. this topic is one of the things I have been searching for quite sometimes. Its about sunscreen/sunblock. Understanding more about Sun protection product. There are alot of topic to be covered. Today is about is the SPF value can be added? I have this perception of the more SPF product I use the better. NO! So I have illustrated some situation for you guys to understand better about it. This is just the basic, through some research I made. ANSWER : NO! SPF does not add value through product you are using. SPF only works to the first SPF product you are using. 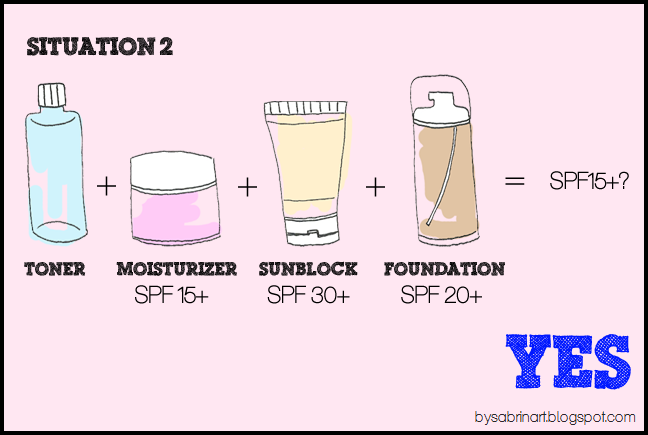 SITUATION 2 : THE FIRST PRODUCT THAT CONTAINS SPF IS THE PROTECTION VALUE I'M GETTING FROM THE SUN. ANSWER : YES! Your skin will be protected to the product that contains SPF that is nearest to the skin. That is the first product that contain SPF. In Situation 2, Your have applied moisturizer first instead of Sunblock. So the protection you will be getting is from the moisturizer although Sunblock have higher SPF value than the moisturizer. If you prefer to use the moisturizer first but you want protection from the sunblock product, use the sunblock first. Will be discuss in the overall picture. SITUATION 3 : THE LAST PRODUCT THAT CONTAINS SPF VALUE IS PROTECTING MY SKIN. 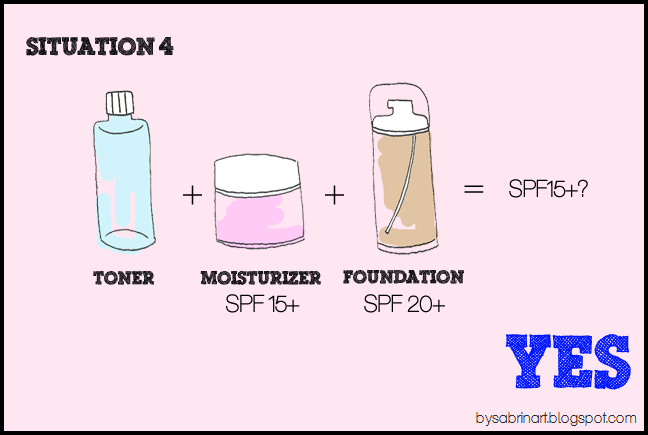 SITUATION 4 : I DON'T USE SUNBLOCK, BUT MY MOISTURIZER THAT CONTAINS SPF DO PROTECT MY SKIN FROM THE SUN. ANSWER : YES. As mention, product that is combine with SPF ingredient does protect your skin and since it is the first product applied to the skin, it protect you skin as what the product SPF value served. As picture shown, the dangerous UV Rays strikes through all of you product reaching to your skin. The first product that is closest to the skin will protect you. Remember, SPF does not protect your skin 100%. There are values that need to be understand but still, SPF product protection is a must in skin care routine and advise to be re-apply every 2 hours during the whole day outdoors. I hope the illustrated picture by me give you better understanding. Will be covering more about Understanding SPF Product & Protection in the future! **I am not a beauty consultant nor a professional. The data I gather is based on my research through a lot of websites and videos by professional. This is a very good info dear. I like how you illustrate from the pictures. Good Job!! really useful entry Sab..sblum ni pun ingt jmlah spf blh cmpur2 dgn semua produk yg kt pkai..
hehe, me too! glad i found some info in the web! you make this so easy to understand! I just doodle them! haha! 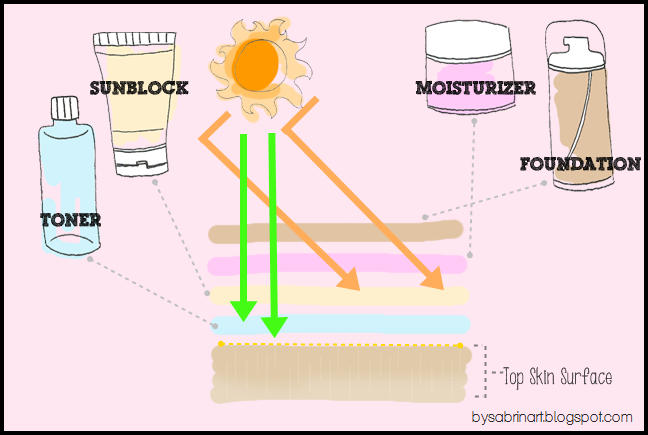 I've been wanting to post this up for a long time because I also been researching over SPF for a long time. However, there are a few things that I found differently. Will make a cross reference to your post once I put it up.